THE CORONAS, one of Ireland’s best loved bands will headline at the Big Top to close the Absolut Big Top music programme at the Galway International Arts Festival this summer, while the day before 2FM’s Jenny Greene and the RTÉ Concert Orchestra join forces for a night of dance anthems. Both shows are being billed as ‘End of Festival’ gigs. Jenny Greene and the RTÉ Concert Orchestra play on Friday July 28, while The Coronas play on Saturday July 29. The collaboration between Jenny Greene and the 48-piece RTÉ Concert Orchestra debuted at Electric Picnic to rave reviews in 2016, where the show featured live performances of nineties club classic hits such as ‘Silence’, ‘Adagio for Strings’, ‘Everybody’s Free’, ‘Insomnia’, and ‘Missing’. Such was the success of the gig and the response to it, that the show, entitled Dance Anthems, complete with stunning visuals, featuring Gemma Sugrue on vocals, and with conductor Gavin Murphy, played two sold-out gigs at Dublin’s 3Arena earlier this year. 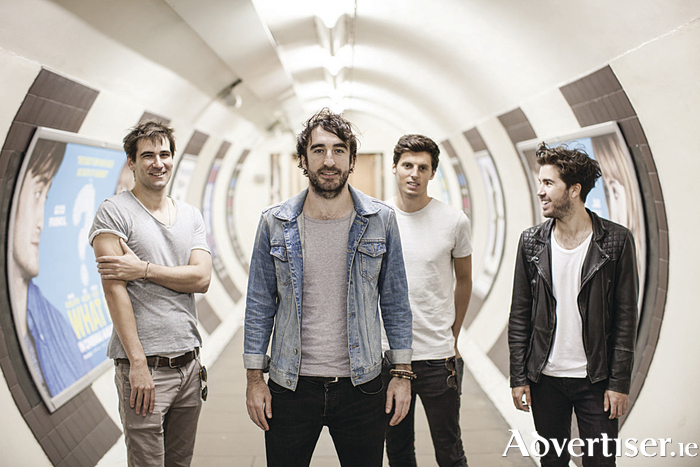 One of Ireland’s biggest selling rock acts, The Coronas have several platinum-selling albums to their name, including Closer to You and The Long Way. The band have toured across the world over the last number of years, while still managing to remain one of Ireland’s most popular live acts. These ‘End of Festival’ summer parties also include support acts to be announced, pop-up appearance by French street theatre company Close-Act, and food concessions including gourmet street food. The concerts are ‘Galway International Arts Festival and Róisín Dubh presents...’ events. Tickets for Dance Anthems are €49.50. Tickets for the The Coronas are €35. Tickets for both shows go on sale on Thursday April 27 at 9am.